Fiercely cute and fiercely loved, the younger siblings of the Monster High™ ghouls aren't ready for Monster High™ high school yet, but they are ready for monster fun! Pawla Wolf™ doll is prepared to fang with her big sister Clawdeen Wolf™ (sold separately) at a family sleepover. 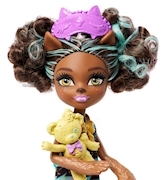 Designed in small scale (5.5 inches), the little sister doll is kid-cute with clothing, accessories and details that highlight her werewolf evolution, like oversized hands and feet detailed with fur and her blue-streaked hair up in curls. She wears a colorful nightgown with graphic wolf-eye print and pink tulle trim. A storybook decorated with a moon is so fun to read with her big sister. A pillow, wolf-shaped sleep mask and adorable teddy "werebear" bring on sweet dreams. Ghouls at home will love the opportunities to explore family bonding and learn to embrace what makes them unique along with their beast friends from Monster High™.